In March I submitted my PhD, entitled, Urban Climate Governance: The Role of Local Authorities. 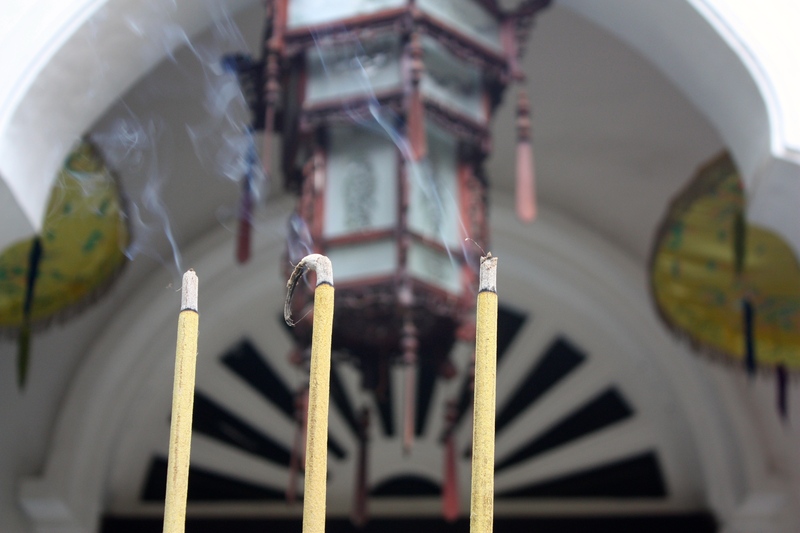 To celebrate, I took a spontaneous trip to Hanoi, Vietnam – booking a ticket on a Friday to leave that Sunday. Admittedly extravagant, it was a lovely way to celebrate such a milestone. I’ve always been enchanted by images of Vietnamese landscapes, and with a few friends living in (or visiting) Hanoi, the pieces fit. 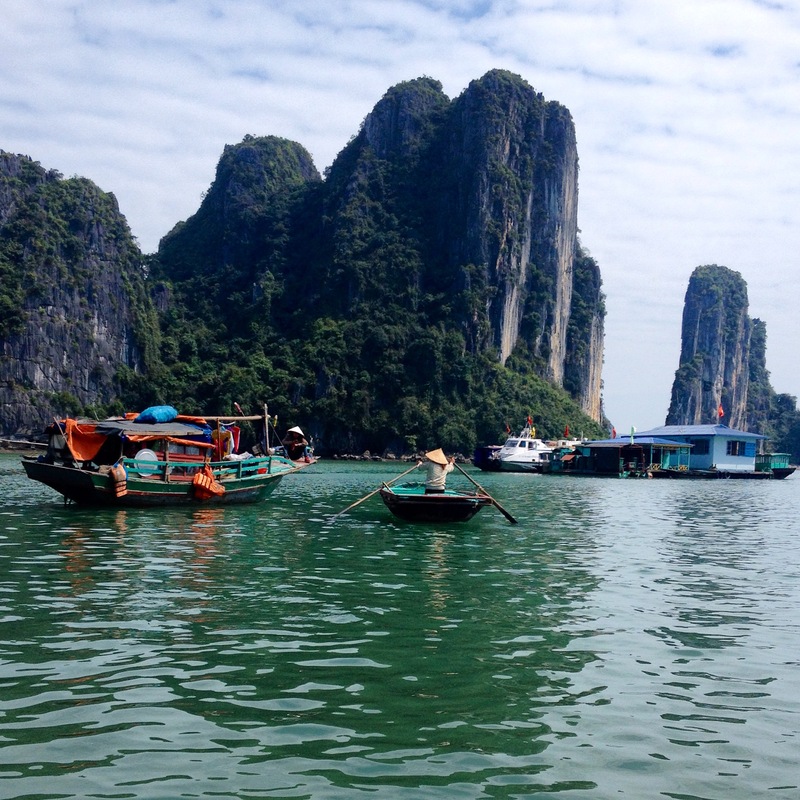 I travelled to the mystical coastlines of Halong Bay where giant cliffs climb like prehistoric monsters out of the sea, and to the rolling mountains and terraced fields of Sapa. 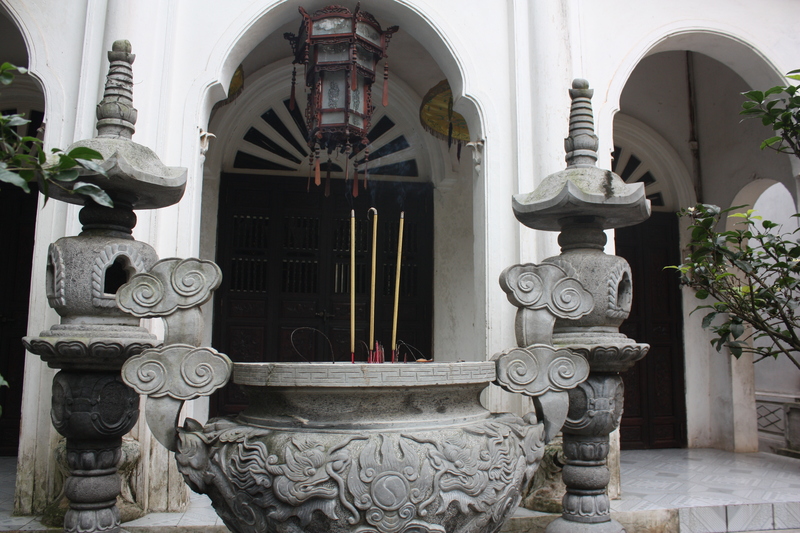 Still, Hanoi was my base – and the source of my blogging inspiration. How to effectively describe this historic, yet modern and growing city of over 4 million – teeming with semi-legal construction projects, jumbled power lines and an “endless appetite to build itself up and tear itself down?” It’s colorful, despite its gray skies and abundance of concrete. Homes are brightly painted and houseplants grow on every balcony, offering small pockets of green. 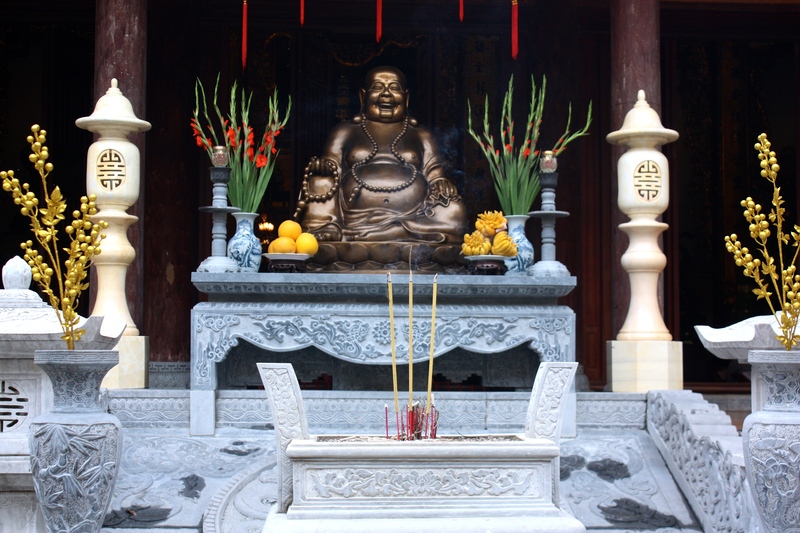 It’s chaotic, with a dose of calm as soon as you step into one of the many Buddhist temples that speckle the city. It’s a city of too many motorbikes – circa 4 million – choking its streets, but just enough horns and (decently) sufficient brakes. 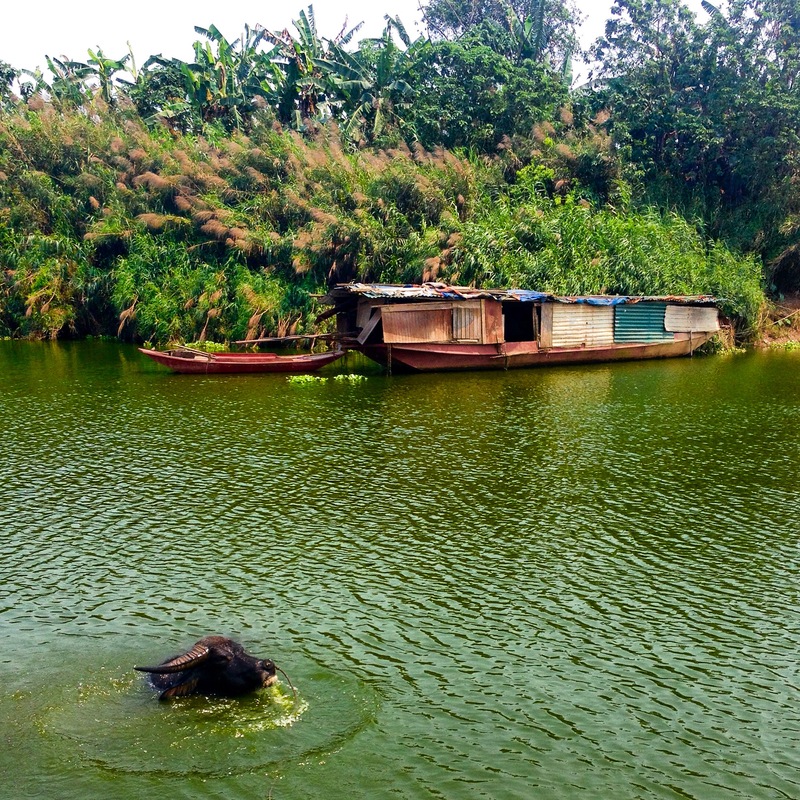 It’s full of pocket-sized lakes and fishermen who dare to enter the murky waters. The larger lakes are speckled with benches for lazy lakeside reflections, small parks hosting evening Tai Chi and aerobics, fancy restaurants, and sidewalk cafés serving tea and cheap watery beer. 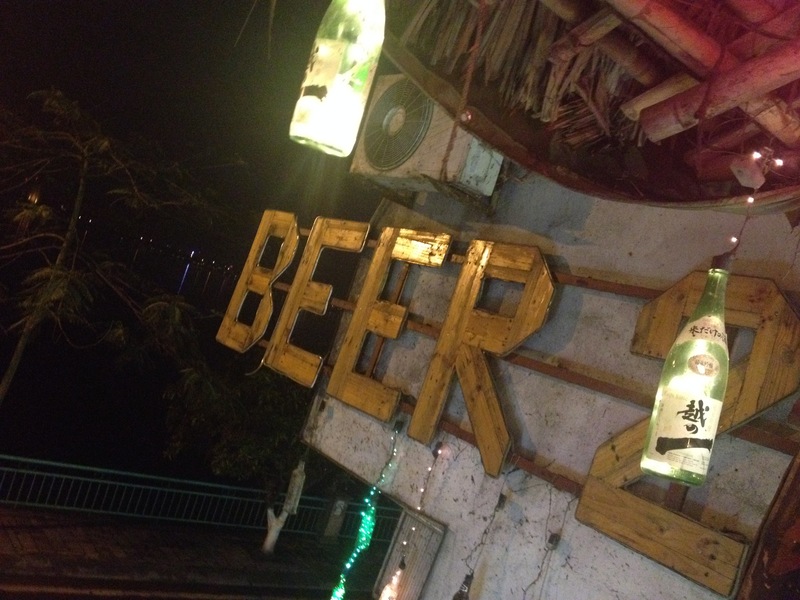 At night, plastic tables line the lakeside sidewalks, serving Bia hơi (fresh beer). Some also serve food: we enjoyed fried nuts, potato fries and fried crickets while sitting in crooked chairs, listening to a blend of Backstreet Boys, Britney Spears and the near constant hum of passing motorbikes. 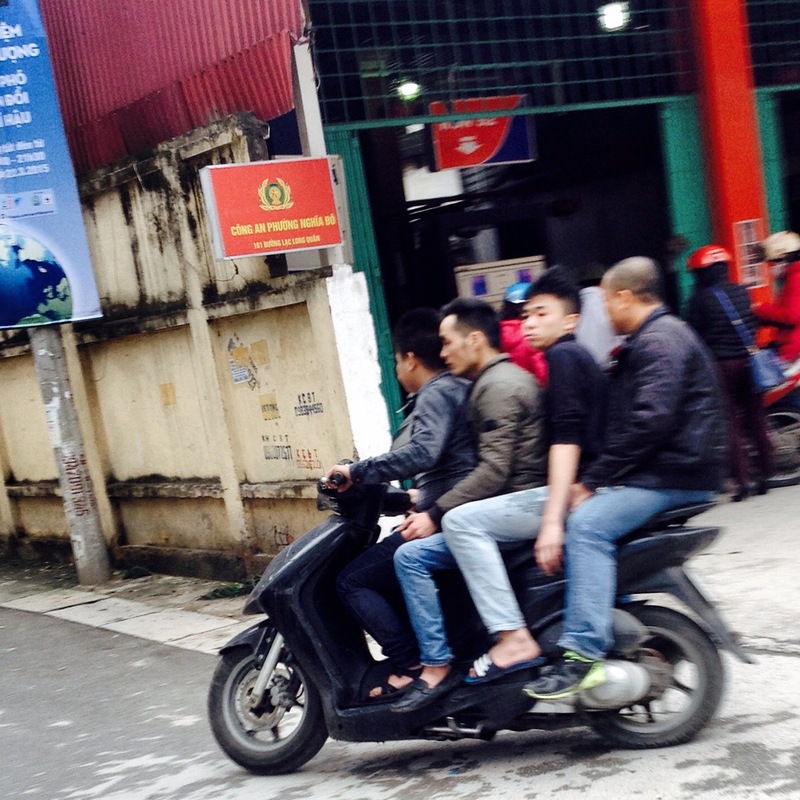 Hanoi is synergy in chaos. To cross the street, you just go: dodging giant market carts, motorbikes, bicycles, buses, trucks, dogs, construction projects. It’s a game of chicken: keep eye contact and walk boldly, trusting brakes will work on time, or that drivers are alert enough to swerve out of the way – and hopefully not into someone else. Navigating Hanoi is literally to play a video game with multiple players and multiple targets. Thankfully, my friend (and motorbike driver) was more accustomed to the madness. Sitting on the back with a camera in hand, I took the city in: dawning a flimsy, albeit stylish, helmet offering a placebo-effect-like sense of security. It’s the law after all. 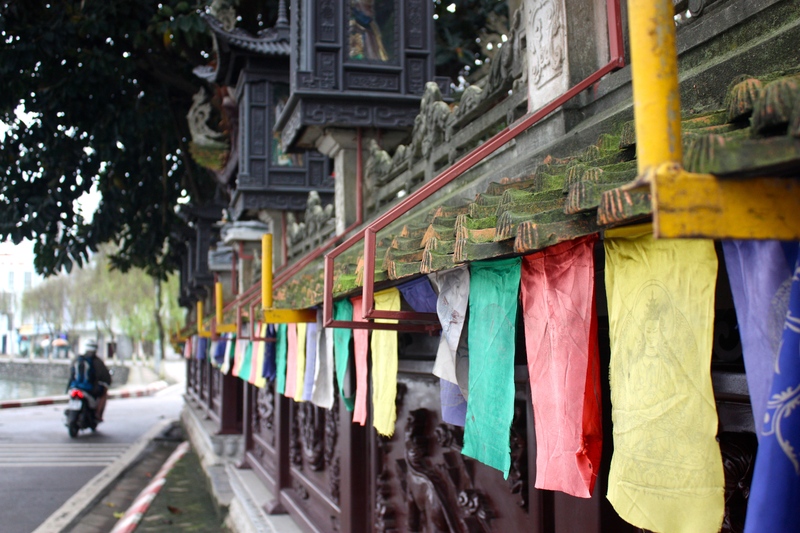 Hanoi is a postcard city and a photographer’s dream. It’s full of bright-eyed women wearing nón lá (the pointed conical leaf hat) while cycling overstuffed market carts through busy streets and crowded alleys, and of little old ladies who carefully and mindfully sweep its dusty streets every morning. It’s full of children (and old men) who skip, jump and hold hands; their conversations echo of spoken laughter. It’s full of alleyway markets selling vegetables, flowers, rice, light bulbs, batteries, shoes, as well as dog (and cat) meat. Chickens roam free on Hanoi’s backstreets, but dogs are chained: learning to become fierce security dogs, or fattened up for dinner. 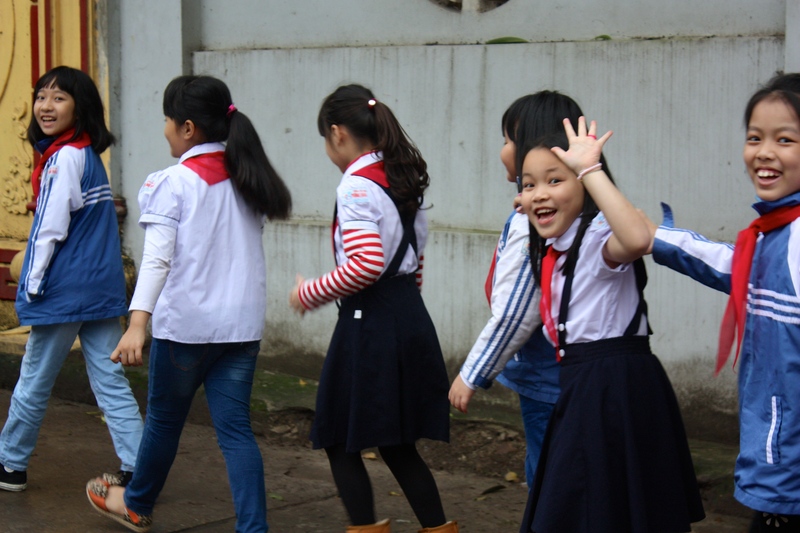 National flags mark schools, offices, and the tall narrow homes of Hanoi’s backstreets. Its city centre feels strangely akin to Moscow’s Red Square – albeit in Hanoi, this square is of grass, not brick. 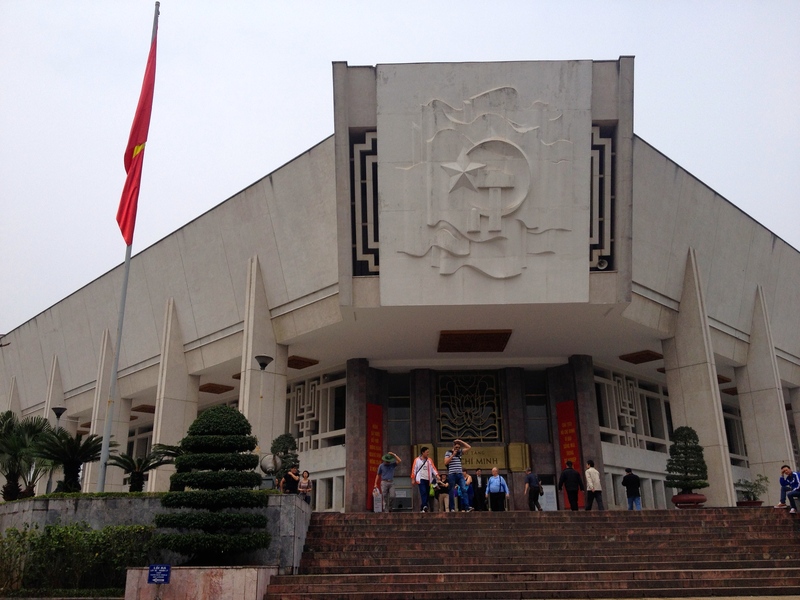 Adjacent to this grass square is Ho Chi Minh complex: the final resting place of Hồ Chí Minh (warmly referred to as Bác Hồ or Uncle Ho), his former home and office, and a commemorative museum dedicated to his life and work. Images of Uncle Ho dot the city, the countryside, classrooms and the currency; and respect for his vision and humble leadership style endures. In fact speaking ill of the Uncle is banned in Vietnam. Visitors are fairly enamored by this topic; I was. Still, the personality cult surrounding Uncle Ho is hardly pervasive. The only time I noticed was when I wanted to discuss it. By and large, locals are proud, but mellow, not specifically nationalistic. 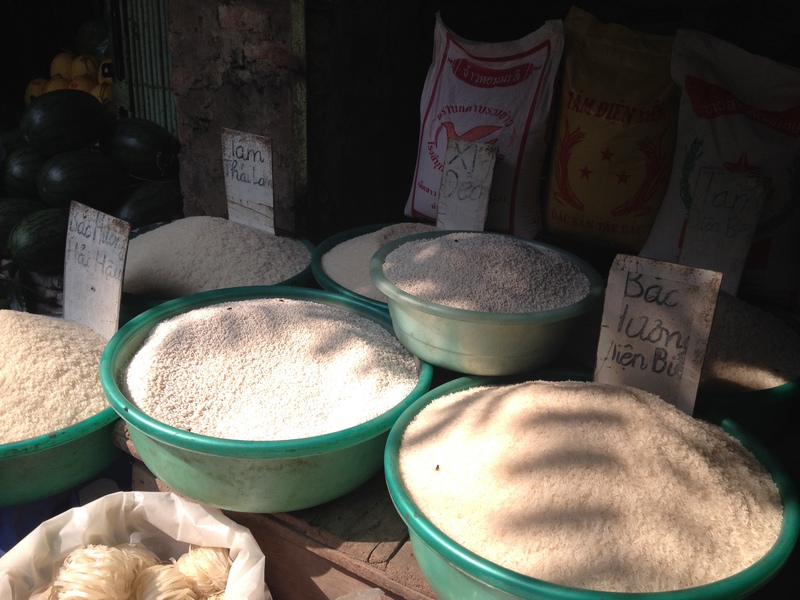 Hanoi is a city of potential, a city of surprises. As the city internationalizes, air-conditioned office towers, hotels and shopping malls become increasingly prevalent. Its Old Quarter though, maintains a street-level charm, despite being overtaken by tourists and venders catering to the tourists. 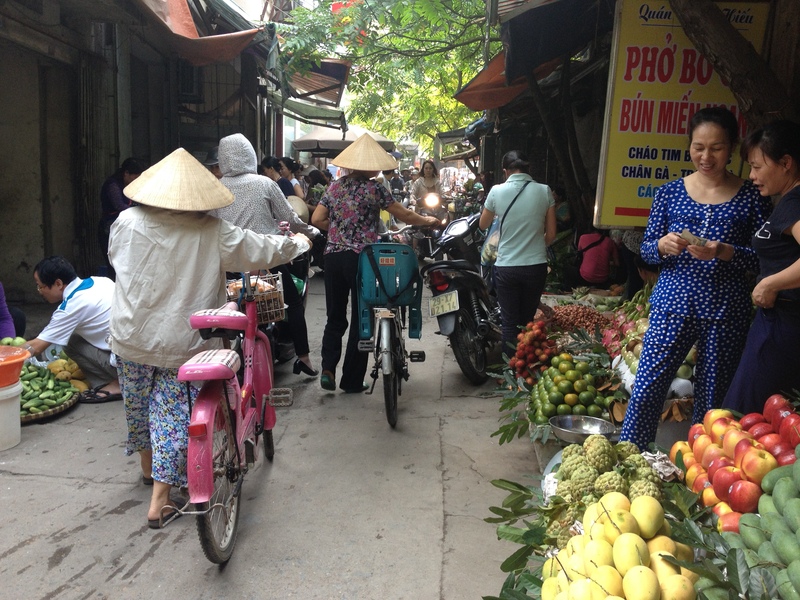 Hanoi is a mix of old and new, madness and calm, gray and green, hardship and hard work. One of the greatest memories I have was also one of my final ones. Just before heading to the airport, my friend took me on one last motorbike ride. In a quest to find the riverbank, we stumbled into a hidden agricultural grove. 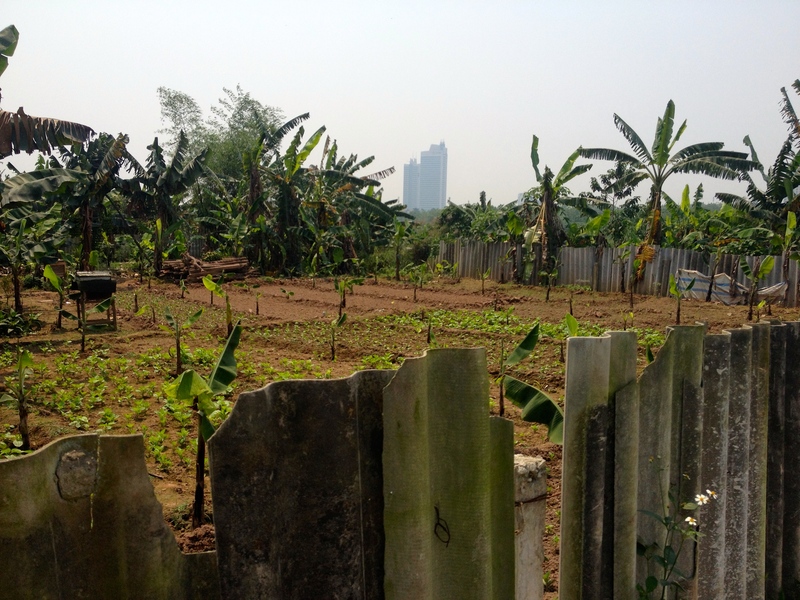 With skyscrapers seemingly far in the distance, we motor-biked on dirt paths near swimming water buffalo and houseboats, through banana trees, cornfields and vegetable plots. 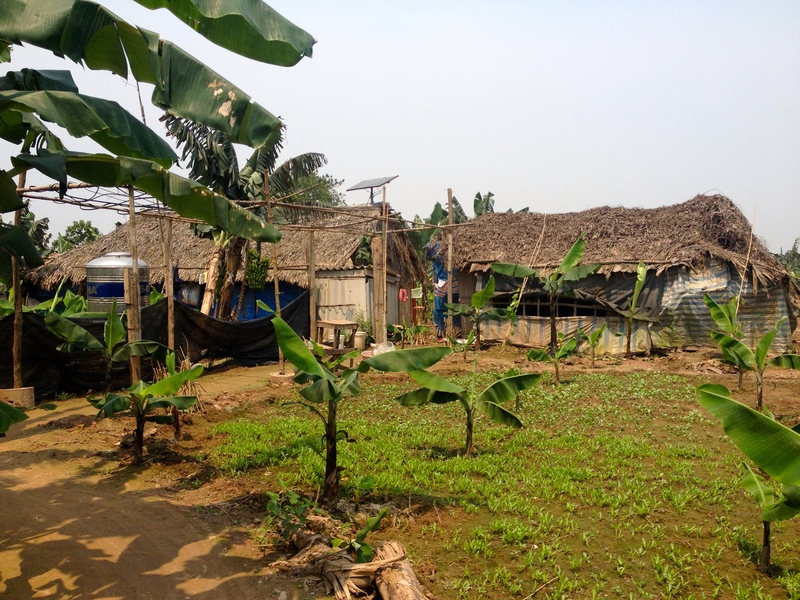 Surrounding the fields were simple (albeit high-tech) homes: their walls constructed of banana leaves, their roofs of palm tree branches or corrugated iron, their energy produced by onsite solar PV panels connected to satellite dishes. As the city expands and evolves, its relationship to urban green becomes all the more important, while increasingly difficult to find. Planners admit that such rural landscapes are increasingly transformed into concrete jungles. 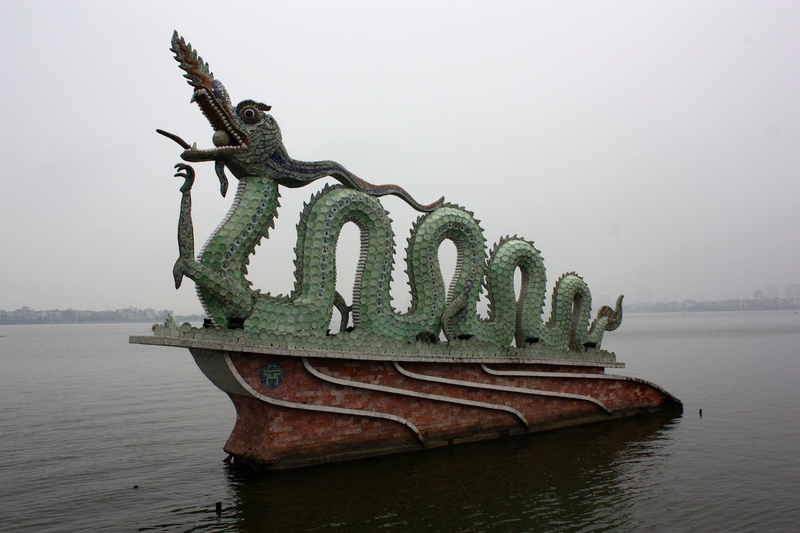 Nevertheless, according to Michael DiGregorio of the Asia Foundation, Hanoi benefits from a relatively “enlightened regulatory attitude of authorities” (Guardian Cities, 2014). 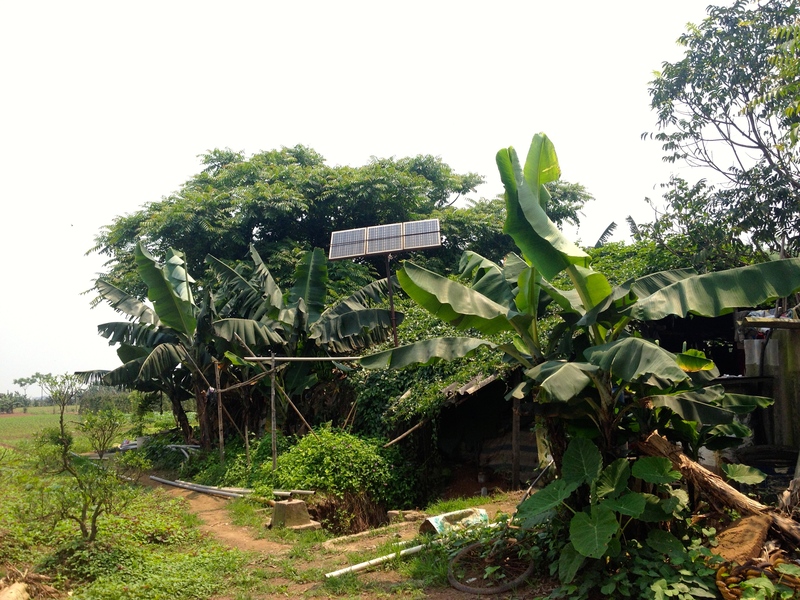 For example, as Hanoi hiccups from its own expansion, planning regulations support more informal developments with provision of basic services, such as water and electricity – resulting in few, if any, city slums. 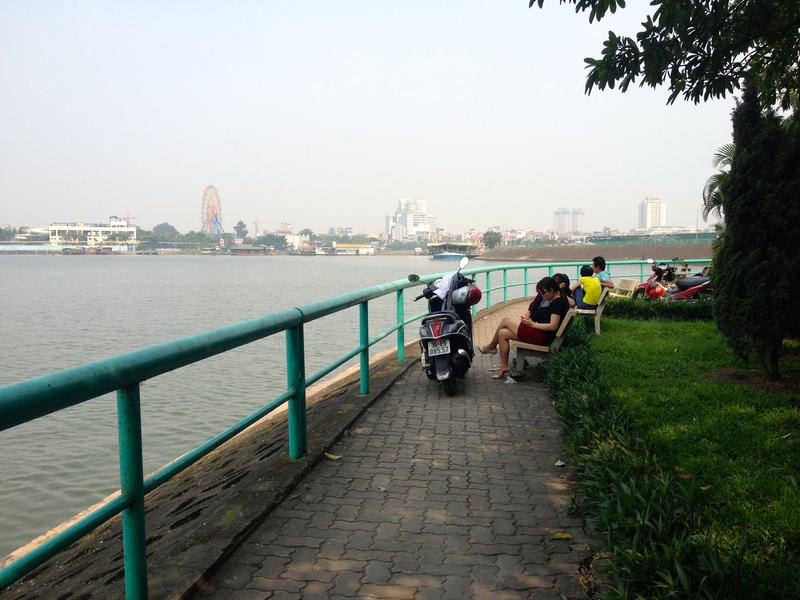 A similar regulatory enlightenment focusing on urban green spaces, and – if one can hope – on traffic calming measures, could better and more visibly display Hanoi’s many charms. Thank you! It was a great trip!